This coming weekend is the annual event for those who wish to know more about the unexplained, Jefferson historic events and Ghosts from the past. Guest speakers include: Mitchel Whitington, Larry Flaxman, David Madrid, Al Waltz, and Dr. Rita Louise. You might be surprised who is coming! Tickets include lectures, noon meal, Historic Jefferson Ghost Walk and Special surprise investigation with the paranormal experts! 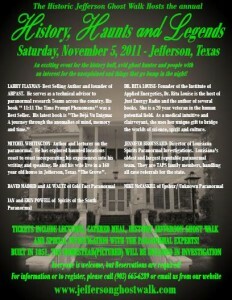 For more information about the Ghosts of Jefferson Texas feel free to visit their site. This entry was posted in Ghosts, History by Tammy D. Bookmark the permalink.